Our 9,000 square foot Spanish Georgian mansion is situated on a half acre in the Garland Hill Historic District, which is on the National Register of Historic Places and is a designated Virginia Landmark. Madison Street, once known as Quality Row and still paved in turn-of-the-century brick, is a parade of Federal and Victorian mansions. The Inn was built in 1914 for James R. Gilliam, Sr., who had the highest income in the city and was president of five coal companies, the Lynchburg Shoe Company and six bank-, throughout the state. 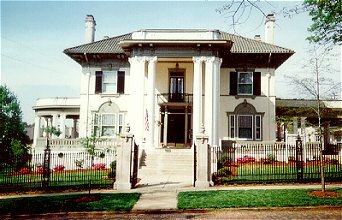 Mr. Gilliam's home exhibited a magnificent display of wealth built for the then princely sum of $86,000. A six foot high iron fence, whose three separate entrance gates are anchored in massive concrete piers, surrounds the main house, carriage house and lush landscaping. Guests arrive driving Linder the columned porte-cochere. Twenty-two immense columns ring the 105' Spanish tiled veranda. The double door entry opens on to a fifty foot Grand Hall with soaring ceilings and unequaled cherry and oak woodwork, including great wide cherry columns and thick panelled cherry wainscoting. The oak and cherry main staircase winds up three stories and has 219 balustrades. The second floor is as extravagant as the first. The Lynchburg Mansion Inn Bed & Breakfast has become known for attention to detail and quality of service. All guest rooms are lavishly furnished and decorated with your every comfort in mind. Begin your day with the morning newspaper at your door. A freshly brewed pot of coffee and orange juice on an antique washstand upstairs awaits early risers who appreciate the chance to "wake up" in their rooms before breakfast. Then enjoy a heavenly full breakfast served in our formal dining room with gold-encrusted service plates, fine china, crystal and silver. We at the Lynchburg Mansion Inn Bed and Breakfast aim to satisfy your every need during your return to a finer yesterday. This and other Lynchburg Bed and Breakfast Inns can be found here in The Register.